The first year that Bob Webb Homes used transom windows in the showcase house the company built for a home tour, visitors described the house as bright, warm and inviting. While few mentioned the windows, company representatives said tour participants were responding favorably to the additional natural light provided by the horizontal windows above the home’s more traditionally placed windows. Taking a lead from architects who design office buildings, residential builders and architects say they are increasingly looking for ways to incorporate natural light into homes. (Numerous studies have shown that office workers with windows are healthier and happier.) In addition to transom windows, many new homes include large sliding glass doors, interior glass doors and thoughtful window placement that lets light pass through multiple spaces. Improvements in weatherproofing and insulation materials and in installation methods for windows and doors have made it possible to increase the amount of glass in a house without creating drafts, said Shively. In many cases, architects are incorporating these features because they see their value — even if clients don’t request them, says Stu Narofsky of Narofsky Architecture in New York City. Sometimes the additions are simple, like placing a bedroom window where the light it lets in will illuminate a hallway, or adding glass panes to a door for the same purpose. Other additions are more dramatic, like making an entire wall of glass. Bob Webb’s latest show home, designed for the 2018 BIA Parade of Homes in Columbus, Ohio, features a retractable glass wall in the living room and a basement workout room that’s delineated by sliding glass, barn-style doors. More Midwest builders have begun using the retractable walls, which have long been prominent on the West Coast and Hawaii, because they too have undergone improvements that allow them to be used in colder climates, Shively said. 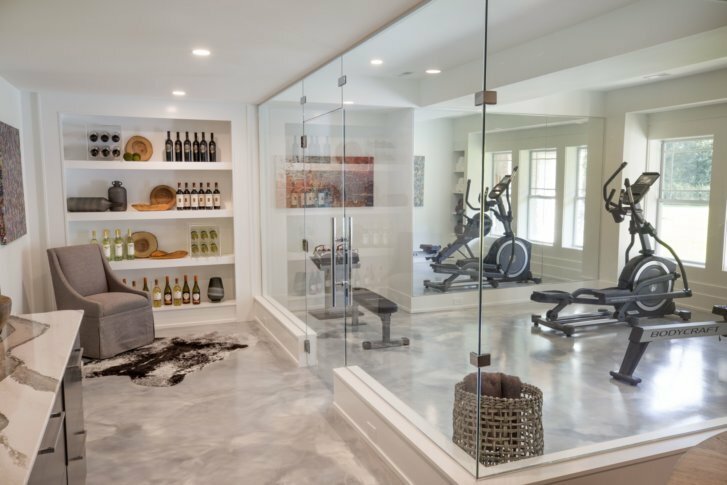 The see-through doors to the exercise room serve two functions, he said. They help incorporate the workout area into the main room and provide natural light to the whole space. The doors work because the architect also incorporated deep, wide window wells into the basement’s design. “It’s amazing what those deeper wells can do. It makes a huge difference, and that light bleeds into the rest of the lower level,” Shively said. In several homes that Narofsky has designed, he has found an extreme solution for incorporating natural light in the lower level: digging out the layers of soil around the basement. In the space that’s created, homeowners have planted terraced gardens and, in one case, added a pool. Homeowners who aren’t planning to build a new house still have options — at a variety of price points — for bringing more natural light into their space, said Jim Bimstefer, an associate broker with Keller Williams Realty in Baltimore. As a remodeler, Christopher Wittmann regularly considers utilizing natural light when helping homeowners plan renovations. Depending on the project, he might suggest larger windows, glass doors or removing a wall, said Wittman of Callen Construction in Muskego, Wisconsin.